Exploding phones are the least of Samsung’s worries. On Thursday night, a South Korean court formally removed the country’s president, Park Geun-hye, from office. The removal came four months after a corruption scandal rocked the foundation of not just the South Korean government, but also the nation’s biggest company. Last month, Samsung’s de-facto leader, Lee Jae-yong—known as Jay Y. Lee in the western world—was arrested by South Korean officials in connection to a blockbuster corruption scandal. On Thursday, Lee formerly denied the bribery charges brought against him and four other Samsung executives. An official trial date hasn’t been set, but the results could have huge implications for the future of Samsung and the family that controls it. In South Korea, the chief prosecutor has said that Lee’s trial could be “the trial of the century.” While it might sound like the hyperbolic tagline for a cheesy crime novel, the case is truly outlandish—it involves interpersonal family drama, millions of dollars in alleged bribes, anti-semitic insults, corrupt government officials, and even a shamanistic cult. Before we wade into the details, however, it’s important to know a bit about the corporate structure of Samsung in South Korea. Samsung is known as a chaebol—similar to a US conglomerate—and the entire operation, which includes Samsung Electronics, Samsung Life Insurance, and exploding battery-purveyor Samsung SDI, is controlled by various members of the Lee family. Chaebol is a big deal in South Korea, and it’s also been closely aligned with South Korean politics for many years. (More on that later.) 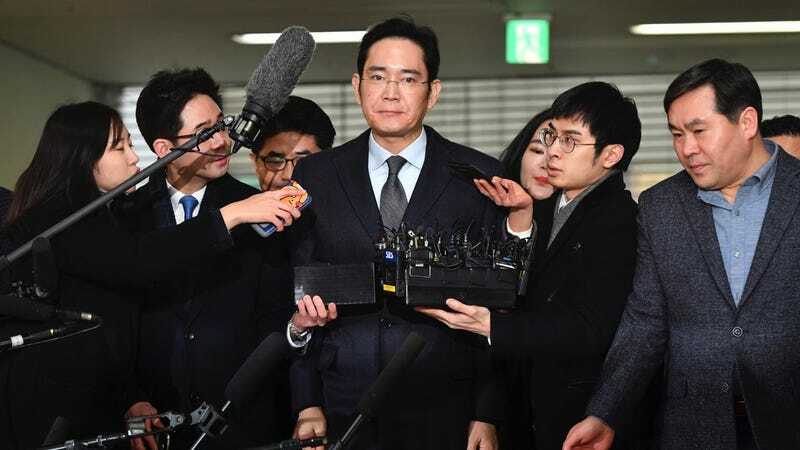 And while Lee and his executives are technically on trial here, the chaebol system, in which family control is crucial, is also under the microscope. After all, this whole scandal essentially boils down to one thing: the Lee family making sure Jay Y. Lee could succeed his father in running Samsung. Technically, Samsung’s current chairman is Lee Kun-hee, but after he suffered a heart attack in 2014, day-to-day operations were effectively passed on to his son, Jay Y. Lee. The younger Lee is known in the press as the “Crown Prince of Samsung,” and as the eldest child and only son, he’s been groomed to succeed his father for years. However, the succession hasn’t been without its kinks. In May 2015, two of Samsung’s affiliates, Cheil Industries and Samsung C&T, announced that they planned to merge. The deal was crucial—combining these companies together would solidify the shares needed to keep succession in the family. But while a merger would be good news for the Lee family, it wasn’t necessarily good for other Samsung investors. Elliott Associates, a US-based hedge fund and Samsung C&T’s third largest shareholder, opposed the merger, and the company’s CEO Paul Singer was publicly critical of the deal. Samsung C&T had a large stake in Samsung Electronics, one of the chaebol’s most valuable assets; Singer argued that Chiel Industries’ owners—members of the Lee family—would wind up gaining significant ownership in Samsung Electronics for cheap. Ultimately, the vote did go in Samsung’s favor, resulting in the successful merger between Cheil Industries and Samsung C&T. Crucially, however, this was done in part thanks to support from South Korea’s National Pension Service (NPS), which held a 9.9 percent stake in Samsung C&T and a 5 percent stake in Cheil Industries. Here—finally—is where the bribery accusations enter the picture. Allegedly, now former-South Korean President Park Geun-hye and her close confidante Choi Soon-sil pressured NPS to approve the merger, thanks to the payments from Lee and others at Samsung. Mr. Lee is accused of instructing Samsung subsidiaries to make payments totaling 43 billion won, or $36 million, to the family of Ms. Park’s confidante, Choi Soon-sil, and to two foundations Ms. Choi controlled in exchange for help from Ms. Park in facilitating a father-to-son transfer of ownership control of Samsung. Those alleged bribes took all kinds of forms, including a $900,000 horse for Choi’s daughter. Samsung has admitted that it gave money to Choi’s foundations and that it provided the money for the horse, but denies being part of any wrongdoing. The prosecutors argued that Lee made these “donations” as a way to curry favor with Park, ensuring the 2015 merger could go through. In an added wrinkle, at the time of the merger vote, the chairman of the NPS, Moon Hyung-pyo, was also South Korea’s minister of health and welfare. Prosecutors arrested Moon in December over charges that he used illegal pressure to force approval on the merger. The story doesn’t end there, however. This past December, Park was impeached by parliament in a wide-ranging corruption scandal. She was formally removed from office on Thursday night, and now faces criminal charges of extortion, abuse of power, and bribery. Ms. Park and Ms. Choi were accused of conspiring to collect tens of millions of dollars in bribes from businesses. Ms. Park was also accused of letting Ms. Choi, who had no experience in policy making, edit her speeches, install acquaintances as senior government officials and influence state affairs from the shadows. But times could be changing. Increasingly, the people of South Korea are becoming more uncomfortable with the idea of chaebol. And if Jay Y. Lee is convicted once the trial starts, it could put Samsung’s carefully crafted succession plan into massive disarray. Depending on who succeeds Park in office, as well as the general sentiment in South Korea, Lee—and Samsung—could face real repercussions. It’s too early to make any bets about how this will all play out, but we’ll be watching.